AVA beads are V shape beads which can be used in novel ways in beadwork. 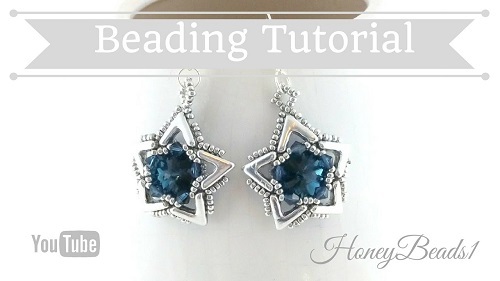 The obvious way to use them are to make star earrings! Check out these two tutorials. The first is by HoneyBeads1. It is a fast and easy method resulting in an open design. I love how she made it a simple job of bezeling the rivoli centers. The other tutorial designed by Phyllis Brunson-Sutton for the Potomac Bead Company. There are no rivolis for this design but it is still a stunner! Going to get some AVA beads now,eh? I LOVE getting this email!!!!!!! You don't hold back on info and have great pictures. It's awesome to get free tutorials online when so many want to charge for everything. I save all my emails from BGJ and go back and look at them and do the projects. KEEP THEM COMING!!!! Thanks for appreciating my curation of great tutorials to inspire you all!